Three southwest Iowa men are in custody following a chase involving four vehicles and shots fired early this morning in Adams and Union Counties. Adams County Sheriff Alan Johannes says 19-year old Logan Jenkins faces 5-counts of attempted murder and one-count of going armed with intent. His 22-year old brother Trenton and 44-year old father Eric Jenkins, all from Prescott, were both charged with five-counts of Assault While Participating in a Felony, following an incident which began just before 1-a.m. in Adams County, and ended on Highway 34, on the outskirts of Creston. Johannes says the trio were in three separate vehicles which were chasing another vehicle. During the chase, Logan allegedly fired multiple rounds from a rifle, some of the bullets from which struck the vehicle being chased. That vehicle was occupied by five people, all of whom were under the age of 18. None of persons in the chased vehicle were injured. 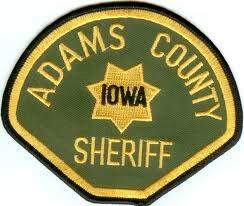 The Jenkins’ were being held in the Adams County Jail. The incident remains under investigation. Two Harlan residents, an adult and a juvenile, were arrested May 6th following an investigation into an alleged assault. Police in Harlan reported Thursday, 17-year old Emily Boeck was charged with assault in connection with an incident allegedly involving Ashley McWilliams, of Harlan. Boeck was cited and released to the custody of her mother. 25-year old Zachary Scheffler was arrested in connection with the incident, and charged with domestic abuse assault, and violation of a no contact order. If Scheffler and Boeck’s names sound familiar, that’s because last Friday, we told you the were arrested April 30th when police executed a search warrant for Scheffler, at a residence in Harlan. During the course of the search, Boeck was one of five people charged with interference with official acts. Scheffler was arrested following the search, on charges of Possession of a Controlled Substance and Drug Paraphernalia, interference with official acts, criminal mischief, and on a warrant for domestic abuse, in connection with an incident April 22nd, during which he allegedly vandalized McWilliams’ vehicle. The Harlan Police Department reports four area teens were cited last weekend for Minor in Possession, of Possession of Alcohol under legal age. The citations and one arrest were made during a patrol of the races at the Shelby County Speedway. Those cited on Saturday, May 6th, include: 18-year old Amanda Skow, of Atlantic; 17-year old Dezaray Forde, 17-year old Katie Weihs, and 16-year old Sunny Peck, all from Walnut. They were released from custody after being given a citation. Officials say 21-year old Marshall Fischer, of Omaha, was arrested on a Shelby County warrant for theft in the 4th degree. The U-S Attorney’s Office for the Southern District of Iowa said today (Thursday) two Pacific Junction residents were sentenced Monday, to a total of five-years in prison for being persons prohibited from possessing firearms and ammunition. 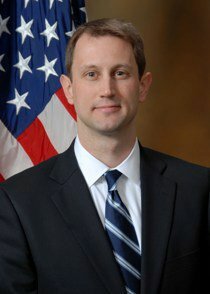 U-S Attorney Nicholas A. Klinefeldt say District Court Judge James E. Gritzner sentenced 49-year old Gustine Evelyn Augustine to 24 months of imprisonment, to be followed by two years of supervised release, and, 36-year old Joseph Lynn Belt, was sentenced to three years probation, to include 180 days of home detention except for maintaining his long-time employment. Judge Gritzner also ordered Augustine and Belt to pay a $100 fee to the Crime Victim Fund. In addition the defendants were ordered to forfeit of seven rifles and shotguns which were in their possession. Gustine Augustine remained on pretrial release and supervision pending designation of the Federal Bureau of Prisons facility at which she will serve her sentence. A Federal jury in Council Bluffs found Augustine guilty On February 9th, 2011 of being a prohibited person in possession of firearms. Belt had entered a guilty plea to the charge against him a few days earlier. On November 10th , 2010, a federal grand jury returned a one-count superseding indictment against both defendants. In the superseding indictment Defendant Augustine was charged with being a person prohibited from possessing firearms because she was a prior convicted felon and because she was an illegal user of controlled substances. In the superseding indictment, Defendant Belt was charged with being an illegal user of controlled substances in possession of firearms. The charges arose from the exercise of a search warrant by the Mills County Sheriff’s Department on July 23, 2010. During the search, firearms, ammunition, marijuana and paraphernalia associated with the use of methamphetamine were found and seized. The case was investigated by the Mills County Sheriff’s Department and the Federal Bureau of Alcohol, Tobacco, Firearms and Explosives, and prosecuted by the United States Attorney’s Office for the Southern District of Iowa. A lawmaker from southwest Iowa was arrested Wednesday afternoon on an OWI charge. According to Pottawattamie County Sheriff Jeff Danker, Republican State Representative Greg Forristall, of Macedonia, was taken into custody at around 3:30-p.m, after a sheriff’s deputy observed a vehicle driving erratically in Carson on Highway 92. Danker says the deputy was eastbound, and he had to pull onto the shoulder of the road to avoid a vehicle that was driving westbound in the eastbound lane. He followed the vehicle and observed it swerving again, into the eastbound lane. The deputy stopped the vehicle and spoke with the driver, who was identified as the 61-year old Forristall. Danker said Forristall told deputies he was on his way home to rural Macedonia from Des Moines. Because Forristall is diabetic, an emergency rescue crew was called to the scene to see if health issues contributed to the erratic driving, but Danker says the man checked out OK. He was then given a field sobriety test, which Forristall failed. Forristall was brought to the Pottawattamie County Jail in Council Bluffs where a blood alcohol content test was administered. Danker said the test yielded a result of .276; .08 is the legal limit in Iowa. He was subsequently arrested on suspicion of first offense OWI. After being booked into the Pottawattamie County Jail, Forristall posted $1,000 bond and was released. DES MOINES, Iowa (AP) – A key Iowa Senate committee has approved a measure designed to block plans for a Council Bluffs clinic that would offer late-term abortions. Backers said the measure was narrowly drawn to block Nebraska Dr. LeRoy Carhart, who announced plans for the Council Bluffs facility after Nebraska passed late-term abortion restrictions. Critics worried that the measure could lead to more late-term abortions. Under the measure, late-term abortions could only be performed in clinics in cities that have hospitals offering intensive care services for infants. There are five such facilities, one each in Davenport, Cedar Rapids and Iowa City and two in Des Moines. The Senate Ways and Means Committee approved it on a 9-6 vote, sending it to the full Senate for debate. Officials with the National Weather Service in Des Moines said Thursday, two tornado struck the Taylor County community of Lenox, Wednesday afternoon. An analysis of the storm data and damage indicated the first tornado, an EF-0 packing winds of up to 80-miles per hour, touched down at around 4:38-p.m. along south Maple Street in Lenox. The twister left a curved path three-tenths of a mile wide and six-tenths of a mile long, during which it damaged several trees and the roofs and facades of two brick buildings on North Main Street. The second tornado, an EF-1, with wind speeds of up to 105-miles per hour, touched down at around 4:43-p.m., in the southwest part of Lenox, near the intersection of State Highway 49 and West Platte Street…just a couple of blocks from where the first twister touched down. The tornado left a path of destruction three-tenths of a mile wide and 1.2-miles long. The greatest amount of damage occurred shortly after the twister made landfall, with one house sustaining damage to a second story dormer, and a manufactured home losing one-half of its roof. Additional damage was incurred upon trees and shingles on homes as the tornado continued its northerly trek on the ground. It eventually turned northwest and hit an older home and business before finally exiting Lenox and continuing over open fields before dissipating one-half mile north of town at around 4:48-p.m.
DES MOINES, Iowa (AP) – Governor Terry Branstad has issued an emergency disaster proclamation for Taylor County to help the county recover from tornado damage. The proclamation was issued Thursday. It will allow state resources to be used to respond and recover from Wednesday’s storm. Resources, such as Iowa Department of Transportation trucks and equipment and Iowa Department of Natural Resources personnel will be used to help remove debris in and around the town of Lenox, which suffered the most damage. The proclamation also provides grants of up to $5,000 for households with maximum incomes of $37,000 for a family of three. The grant program allows local authorities to establish a voucher system to help people who don’t have the up-front funds to begin repairs. Authorities are investigating the death of Page County residents. According to the Iowa Department of Public Safety, the death in Shambaugh, were reported at around 7:40-p.m.
Officials say the Clarinda Dispatch Center received a 911 call from 68-year old Frank Harley McCoy, of Shambaugh. During the call, McCoy indicated that he had killed his wife and was going to kill himself. Local authorities requested assistance from the Iowa Department of Public Safety. Law enforcement immediately responded to the McCoy residence at 506 2nd Street in Shambaugh. The home was secured and officers made multiple attempts to contact the occupants. When attempts at contact were unsuccessful, the Iowa Division of Criminal Investigation, Iowa State Patrol, and Page County Sheriff’s Deputies formed an entry team and conducted a tactical entry into the home. Once inside, law enforcement discovered 68 year old Karen K. McCoy and Frank McCoy dead. 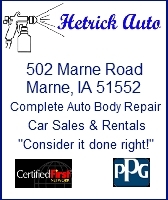 Autopsies were scheduled for today (Thursday), at the State Medical Examiner’s Office in Ankeny. The deaths remain under investigation by officials with Iowa Division of Criminal Investigation, Page County Sheriff’s Office, Page County Attorney and the Clarinda Police Department. USDA Rural Development has two low-interest, no-down-payment loan programs to help eligible families living in rural communities and areas purchase new homes. Loans and some grants are also available to help families make needed repairs to their homes as well. Eligible homes must be located in a community of 20,000 persons or less. The home can be existing or new construction. Existing homes must be structurally sound. Also, the property cannot have any income-producing outbuildings. In most cases a family of four with an adjusted annual income of up to $80,850 may qualify for the agency’s guaranteed home loan program. If that same family of four’s adjusted annual income is less than $56,250 they may also qualify for a direct loan from the agency. Please call your area office to find the exact income limit for your county. USDA Rural Development’s guarantee loan program is administered by a local lender who takes the application, processes it and determines the acceptability of the home to be financed. Under the direct loan program an applicant may be eligible for payment assistance, which would subsidize the interest portion of the house payment down to as low as 1 percent, lowering the overall monthly payment. For more information about finance programs through USDA Rural Development, please call the office located in Atlantic at (712) 243-2107 Ext. 4. This office serves communities, businesses and residents in Harrison, Shelby, Audubon, Pottawattamie, Cass, Mills, Montgomery, Adams, Fremont, Page and Taylor Counties.